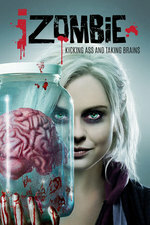 Liv is on hockey goon brain to find out why a human was murdered along with 3 zombies. Major is forced take a road trip with Don E. Peyton has to handle rising tensions in the city. - Correct change?? How does a city like Seattle not just hand out fare-cards? - Oof, this is one tension I do not want to be in the middle of. Also, why is Peyton handling this issue? She's like the chief of staff for the mayor now right? Is that part of her duties? And where is she going to get extra rations for the zombie bus drivers from? - Don E is that person you don't want to go on road trips with. - I enjoyed Don E settling on the show theme song on the radio. Nice touch. - This is the Frenchiest portrayal I've seen in quite some time. Almost offensively so, but damn it's hilarious. I almost thought we should've seen Enzo in the show before, but we haven't, they're just very familiar with him. - Did we know Clive is really into hockey? I feel like we've been told that. Like that's one of the things he has in common with Dale or something. - Omg Clive, please, please stop that. - Man now I want some brain poutine. - I thought Major said no stops! Unless that was for gas, but he couldn't possibly have filled it up that quick. Also, I'm unsure what happened there... did Don E just threatened her and then left without the whiskey and no incidents? How... mature! - Haha yay more Canadian accents! - "That didn't feel like fan appreciation! :("
- "Thanks for texting me." "Would you have forgiven me if I didn't?" "Never." - Ouch, bad time to have a vision on the ice, Liv. - How did that hit make her lose a tooth?? - Ok, "Chinatown", the movie, wouldn't be the first reference I make when someone in a big city tells me that common unsolved murders happening a lot is like Chinatown. I would immediately think they're talking about how the Chinatown area of a city is crime-ridden, which is a messed up statement. - "I still don't get it." "... Goon brain." - Man, I never know what to make of Chase. I can't tell if he's legitimately heartened by Renegade making zombies to save dying humans, or that he's indeed worried about the optics of killing her either because of her reason for making zombies or because she's a "little old lady". Either way I think he needs a scapegoat for Renegade. - Of course Don E went into rage mode and scared the lady and still didn't get the whiskey. - "Make better life choices next time." YOU'RE ONE TO TALK DON E.
- Ok why would you not tie up your kidnap victim and just let them hang out in the hotel room like that? - Second show I've seen this week suggesting to use a dead person's tooth as a substitute for another tooth (the first was Bob's Burgers, which I doubt none of you would've guessed). - Man, goon brain Liv is really bad at interrogations. - Don E's full name is Donald Eberthart? That's hilarious. - Aaand there goes the kidnap victim going off and ruining your plan because you didn't tie her up. - Y'know, I think I'll have to come up with a list of deaths where if that's how I was going to die please make me a zombie. Overdosing (not that I would) would be pretty high on that list. - Wow holding a person of interest for a while and repeatedly questioning them actually worked! I always forget that Blaine tends to make simple stupid mistakes regardless of how brilliant he might come off at first. - "What part of, 'Na na na, I can't hear you' don't you understand?" - Hahahaha Enzo getting his coat pulled over his head like a hockey fight was great. - Wait, was Gordi a zombie that was cured? Why did it seem like he was in rage mode in that vision and Levon was getting him to calm down? Or was Levon talking to another person tell them to calm down while pointing a camera at Gordi? - I guess I could go back and look at the people that were killed in the last episode and compare with the bodies at the beginning of this one... but that's a lot of effort. - Liv's goon brain is almost as bad as Blaine's loose lips brain. - Her goon brain also kept her from figuring out something that a hockey player that gets hit in the head repeatedly figured out? - Heh, now I appreciate "Chinatown" more. - "Why didn't you let me drop that bender like a bag of feed?" "Because I don't know what that means." - Damn, poor bus driver. :( But I can't fault that nurse for just protecting herself. - As soon as they said the bus crashed and that he went berserk I figured he was giving his tubes to his kids. - I honestly don't know how what I would do about the Renegade situation if I was Chase. On one hand you need to have less zombies made, on the other you don't want an uprising against FM-G if you start killing zombies who are considered good people. - "GI Joe!" "Oh. Destro." - Ah... I figured she was this General Mills' daughter when Chase was the one handing her the tubes. - No Major don't encourage him to execute Renegade! - Ok there's gotta be a more efficient way to thaw someone out than heat lamps and blow dryers? - Oh man, that fried brain bite Don E is hocking looks yummy. - I knew Liv was going to step up with that little nod to Renegade! A fun episode that continues to carry the dark tone of New Seattle. Aside from some petty things, I really liked this episode. So at some point Liv is going to clash with Chase, again, and she'll end up on that guillotine and Major will save her! And then General Mills will find out his daughter is a zombie in Seattle and proceeds to nuke it anyway and our protagonists must escape. I was surprised at how...effective?... the actor portraying Chase was in this episode. Well done. Seems like a bad idea to have Liv lose a tooth. I know it's "funny for the episode," but I doubt there's a way to fix it or get a new "chiclet" for real in New Seattle. Can a dentist work on a zombie? I wish she'd just like, colored on it with a marker or stuck a raisin on there or something else silly/nonpermanent. This isn't The Hangover. I'm pretty sure just shoving a dead guy's tooth into your mouth...doesn't work. Also ew. This seems to be the episode everyone hyped/warned you about where Everything Changes. Kinda yeah, I guess? The French guy was a real thing? I figured it was a zombie who ate the brain of a huge Inspector Clouseau fanboy? But no, that's just... the way he is? yeah it was so out of left field i actually checked that he wasn't someone we're supposed to know and this was his first appearance in the show. in a show of a lot of weird, an over-the-top Frenchmen took the cake this time. This was kind of over the top, but brain-poutine and Babineaux's hockey-excitement and Canadian accent made it enjoyable enough to give them a pass on zombie Clouseau. Malcolm Goodwin's comic instincts are underused. > Seems like a bad idea to have Liv lose a tooth. I know it's "funny for the episode," but I doubt there's a way to fix it or get a new "chiclet" for real in New Seattle. I've gotten tooth implants, and it's a pretty intensive and not-quick process. Alternately, she could get a bridge. Anyhoo, yeah, this distracted me so much that I couldn't let it drop. And no, you can't just shove a tooth in your tooth-hole and it stay put. That's why teeth have to have roots. Great episode, but kinda bummed that something I started watching purely for guilty pleasure escapist purposes is now another fascism allegory.